Im a Quilt Aholic and this is my journey to designing my quilts. Each year I set a goal for myself at the beginning of the quilting season. This year I aim to make 15 charity quilts over the winter. So this weekend I was on a roll sewing wise. I was working on one of my PHD’s(project half done) that I had added to the challenge in one of the face book groups that I joined. We have 6 months to complete our UFO’s(unfinished object) or PHD’s. Unfortunately I ran out of thread so finish quilting the “28 Karats” quilt that I was adding 10 inches all around to take it from a double to a queen size as per request of the freind that bought it. My LQS (local quilt shop) is not open on weekends so I guess this project has to wait till I get thread. 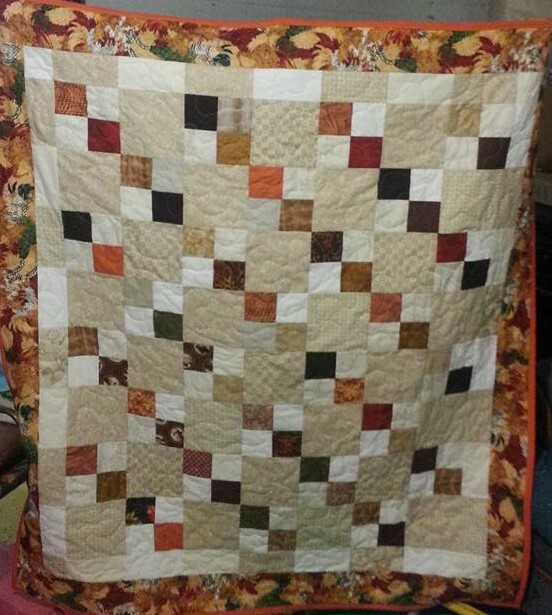 I sure was not ready to quilt so I dug into boxes of cut squares pulled out any fall colors and off white-tan squres this Charaity quilt. This is a pretty easy quilt it has a 7″ blocks. I used a 4 patch block made with 4″ squares and alternated a solid 7″ block. Added a border and voila 1st charity quilt of the year finished. So I started this one on Saturday afternoon and had it all pieced, quilted and bound by Sunday noon. Still not in the mood to stop I pulled out a Christmas panel and made a horizontal runner with it. It’s actualy almost big enough to be a bed runner. I beleive this was a very productive weekend. Now to catch up the house since I dint do any housework being cooped up in my sewing dungion.